The kitchen is the perfect place for family time, entertaining and socializing. With all this activity, it’s bound to get a little disorganized. What’s more, the kitchen is actually listed as the “germiest” area in the home, according to a study by NSF International (the National Sanitation Foundation). Have no fear! Simple solutions can combat common kitchen cleaning conundrums. It’s no secret that many homeowners keep pantry doors shut for a reason -- it can get a little chaotic inside. Kick the clutter. If an item has been in the pantry for three months or more, you likely won’t use it. Toss expired items and donate any non-perishables you aren’t going to use. 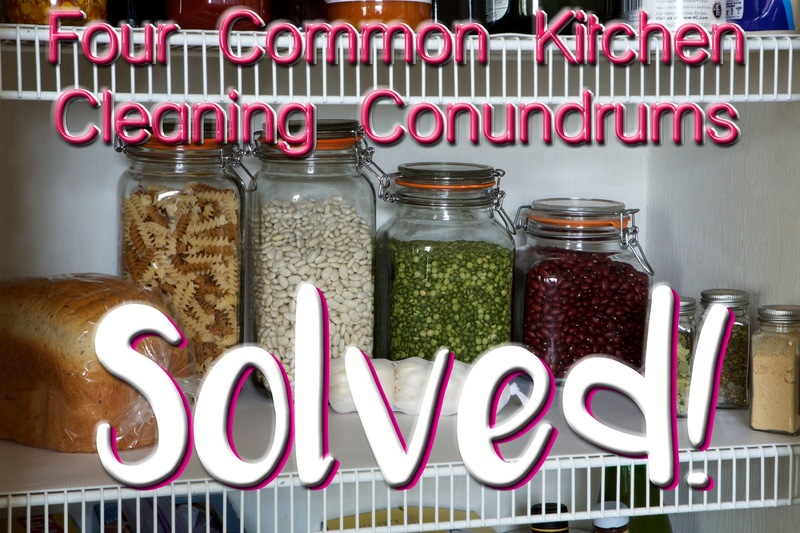 Next, wipe down pantry shelves to remove dust and crumbs from hard-to-reach corners. Before restocking shelves, lay down a non-adhesive shelf liner to protect newly cleaned shelves. Easy Liner brand shelf liner by Duck brand is a good choice, especially the new Solid and Super Grip shelf liner products which feature Clorox antimicrobial protection of the liner to help prevent the growth of odor-causing mold and mildew. They are also machine-washable, so when a big spill does come along, you can just toss the liner in the wash. Soon, you’ll have a clean pantry you’ll want to show off. Between fresh produce, dairy, meat and leftovers, there’s a lot going on inside a fridge. Make it a habit every few months to wash the inside of your refrigerator, even the shelves and drawers (a location where many stubborn spills tend to be forgotten). A natural cleaning solution, like Green Works All-Purpose Cleaner is best for this area in the kitchen. It’s safe to use on a variety of surfaces throughout the kitchen and it’s 98 percent naturally derived, so you can be confident that it won’t leave behind harsh chemical fumes or residue. Sponges are a kitchen staple, and also the germiest item in the entire kitchen, according to NSF research. And after only a few uses, they can develop a foul-smelling odor. Luckily, there’s a quick fix for getting a sponge back in proper cleaning condition. Simply wet the sponge and pop it in the microwave for two minutes to eliminate germs. Ta-da! It’s ready to use. From greasy little hands going in for snacks to frequent opening and closing during meal-prep, grease and grime on kitchen cabinets and door handles can accumulate quickly -- spreading germs and making your kitchen look dirty! To disinfect and deodorize cabinets and other non-porous surfaces, a good bet is Clorox Disinfecting Wipes. First, remove any excess debris and then use enough wipes for the surface to remain visibly wet for four minutes. For food-contact surfaces, rinse with clean water. To clean hard, nonporous kitchen cabinet exteriors, wipe the cabinet on the outside and let it dry. Making it a practice to wipe down cabinets weekly will prevent a lot of grease and build-up in the long run. Carve out an afternoon for cleaning remedies that will knock out the mess and pesky germs in no time.